Deliciously rounded and full of flavour, we blend our classic organic blossom honey with organic royal jelly, the hive’s rich food source reserved for Queen Bees. 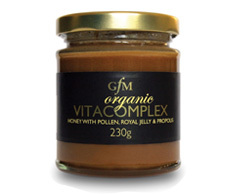 We’ve charged our delicious smooth set organic honey with a blend of the hive’s natural treasures: organic bee pollen, propolis and royal jelly. 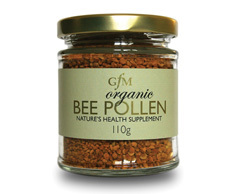 Pollen is gathered to nourish a bee colony; rich in proteins, it contains more amino acids than beef, eggs, or cheese. 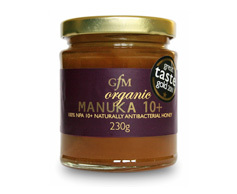 Our Organic Manuka honey is certified to have Non Peroxide Activity (NPA) of 10+. 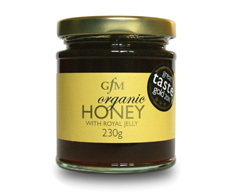 Rich and herbal in flavour, we recommend keeping a jar on the kitchen table as well as in the medicine cabinet! 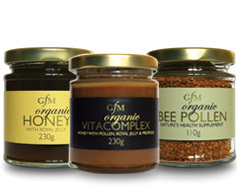 Using 100% organic ingredients, GfM’s fantastic unpasteurised, organic Natural Power Collection contains all the treasures of the hive including pollen, royal jelly & propolis. 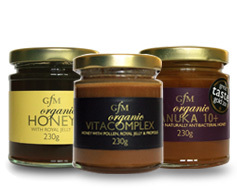 Using 100% organic ingredients and unpasteurized honey, GfM’s Organic Natural Boost Collection is packed with Organic Manuka, Royal Jelly, Pollen & Propolis.